Fortunately, my husband is a man of many talents and he came up with the core idea to prevent poke through from wayward postal workers. 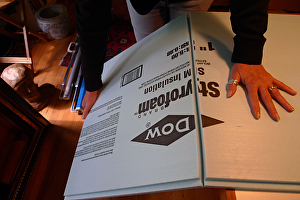 The rest comes from my own background which includes a course in package design way back in the 70’s. 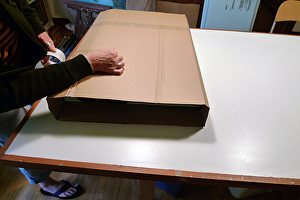 If you can gift wrap a package, you can create the perfect packaging for a canvas. 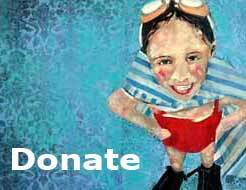 You’ll need a minimum of equipment and almost no money. 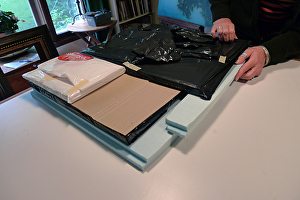 Lay your canvas between your custom made foam pieces to create a sandwich. 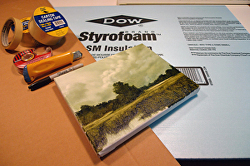 The foam is rigid and dense enough to protect the vulnerable face of your painting. 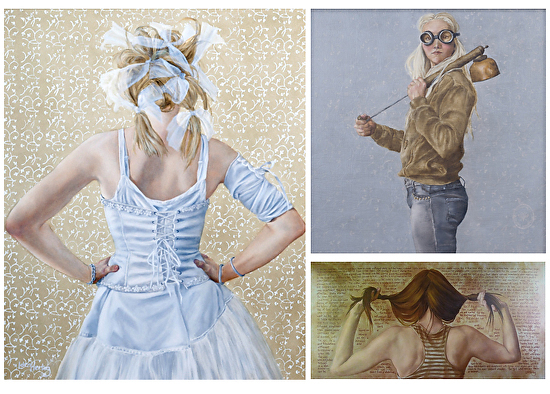 In the second photo you can see that I was shipping more than one painting. 3 in fact. The canvases are layed facing each other and I added a piece of cardboard between them to ensure that there are no indentations from corners that don’t match up. I also added a strip on foam to fill a space left by mis-matched sizes. You’ll need a piece that is big enough to wrap all the way around your foam sandwich and leave enough on the ends to fold over. The idea here is wrap the sandwich tightly in cardboard. 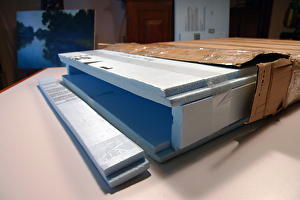 I lay my canvas along one edge and pick the whole thing up and start bending the cardboard around the foam until I have wrapped the whole thing. I leave an overlap on the final side and cut off any excess. 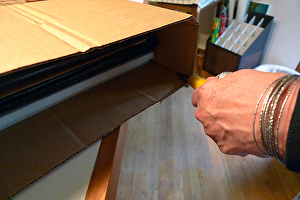 Here I am using my packing tape to hold the cardboard tightly to the foam sandwich. The same rule applies here, go all the way around so the tape overlaps itself. Tape on tape is very secure and won’t lift while in transit. 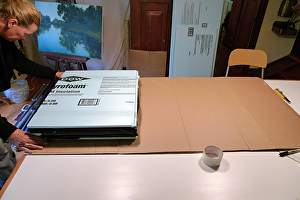 Now you have wrapped your canvas in such a way that it won’t be shifting at all within the cardboard. Now it’s time to tape the ends shut. I use tape that goes from one end all the way around the box in one continuous length. I hold the ends tightly closed while I tape and keep tension on the tape. 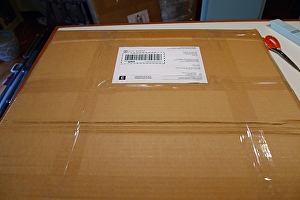 You can see here that I went around my box on each end making 2 straps that hold down the flaps on the ends of the box. Now I am going around again following the narrow edge of the box. I keep going around this edge continuously until the entire edge is covered in tape. 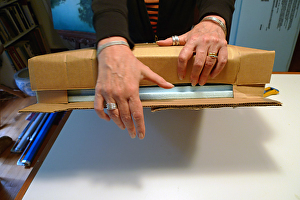 In fact, if you want real security, begin this taping leaving a small overlap that you can fold over to protect the long edges of the box and end with an overlap as well. Tape is very strong when pulled tight and stuck to itself and this method prevents any ripping along the edges of the box while in transit. Yes, it’s a lot of tape, but think of it as a security measure. I have an account with Canada Post and so I can print my own labels from my computer. The USPS offers the same convenience. No standing in line, just print your label and tape it on with packing tape. You can drop off the package at any post office or put it in post box if it fits. A word to the wise…NEVER cover the Scan code on the label with tape. The shininess of the tape may prevent the scanner from picking up the code. 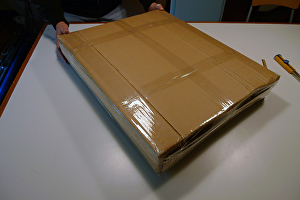 I know that many artists feel they must use one of the big shipping companies (FedEx and UPS) for shipping art. 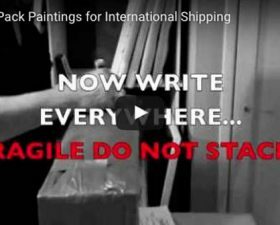 In my experience, USPS and Canada Post do a great job of getting your painting where it needs to go. They are much less expensive and there is a lot less hassle and you can still insure your package. You can ship anywhere in the world without worrying. 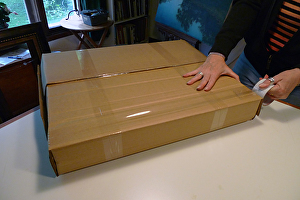 I have had to use the big boys on occasion for really large paintings that exceed the max allowable by USPS and not only did it cost me a fortune, but you can be sure that if it’s crossing a border with the big companies, it’s going to get opened by customs. 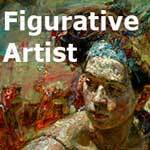 Take my word for it, customs officers don’t give a hoot about your art. Damage will happen, or at the very least you box will arrive mangled. For some reason a box sent through regular mail, even when it crosses a border does not get inspected and ruined. 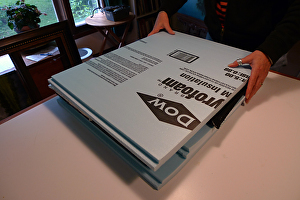 I once had a chat with a very friendly UPS guy and he told me that when they package paintings for clients (for which they charge a fortune) they use almost exactly the same method I use. So now you get to be a professional packer. WooHoo! 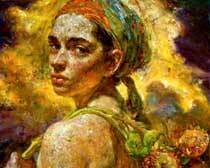 PLEASE NOTE: I am always shipping oil paintings and this method works perfectly for me. 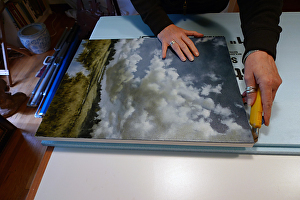 However, I do not build up heavy layers of paint, so my surface is very flat, and I have never had any problem with the plastic touching the surface of my work. 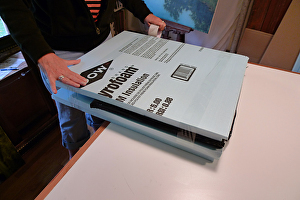 If you are concerned with damaging the surface of your artwork, you can protect it by skipping the plastic wrapping and adding a “frame” constructed of insulation foam around the edges of your canvas. 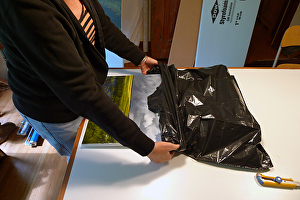 If you make the frame deeper than the canvas and hold it in place with tightly wrapped packing tape, it should prevent anything from touching the surface. Then make your sandwich and wrap the whole thing in plastic before adding your cardboard layer. 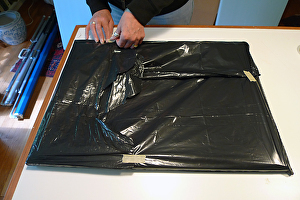 Packaging Framed Paintings: Use this method if you are shipping a framed painting so that the sides of the frame are protected. 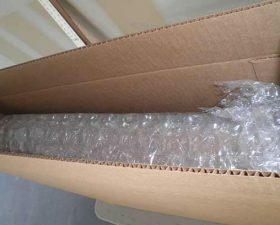 Packaging a Frame with Glass: If you need to ship a framed work that is behind glass, I would suggest you remove the glass from the frame and add another layer to you shipping sandwich. The glass can go between its own layers of foam. Be sure to tape the glass centered on the foam so the edges of the glass are protected. 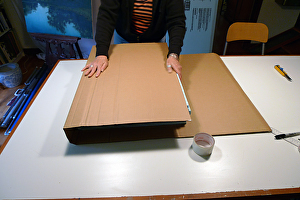 This is a box I created to ship a framed painting. You can see how I made sides to protect the frame. Thanks for sharing your very informative article!